11 Search Results for "#Project Scope Management"
Project Manager: Before we start working on the new website design project,”Chop and Change”, I wanted to document all the requirements. Client: Sure, how may I help you? Project Manager: Let me begin with asking you, what’s your primary goal for the site? …What do you want most from it? Client: The primary reason is to get more inbound leads and enquiries. Project Manager: Ok, so I put that as lead generation. Client: Wait, hmmm..I also want it to increase brand awareness, educate our audience and encourage sales. Project Manager: Ok! So I will also include these as primary goals. Client: No wait! Can we also add encouraging onsite or social media interaction with our community? In current times, we cannot forget the importance of social media engagement. Indecisive clients can be a huge stress. Before being baselined, requirements need to be inambiguous, complete, consistent and acceptable to key stakeholders. This ensures that the client is specific with their requirements, as well as helps to keep the project on track. Project Manager: Boss, here is the detailed plan for the project,”Here Today Gone Tomorrow” that you had asked for. It has the details of resources, tasks, and dependencies, right to the granular level. Boss: Uh oh! Didn’t I tell you that this project has been shelved? 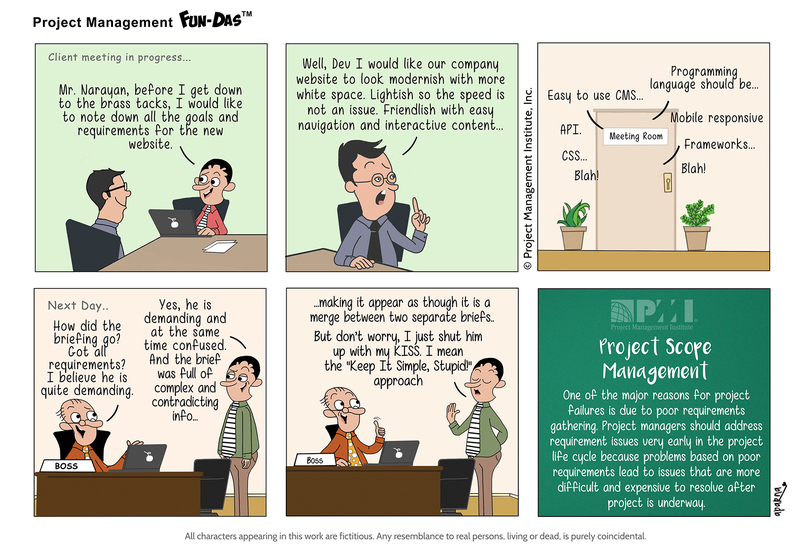 Project Manager: What! But you said you needed it urgently. I have been staying up the past whole week to complete it and now..
Boss: Don’t worry, we will use this plan for another project. I won’t let your efforts go waste. The development of the scope management plan and detailing of project scope begin with information contained in project charter. Hence, it is important to correctly define the project charter at the initiation stage to avoid any difficult situations in the planning stage. Project Manager: Sure, you can count on me for that! Project Manager hypnotizes the Client. Collect Requirements is the process of determining, documenting, and managing stakeholder needs and requirements to meet project objectives. The key benefit is that it provides the basis for defining and managing the project scope. Project Manager: Team, here is a new project that starts from tomorrow... and make sure we meet its deadline. Product Demo within the team... Project Manager: What's this extra feature? It was not in the scope! Team member: I added it! Coz I thought it would be 'COOL' to have it in the end product! 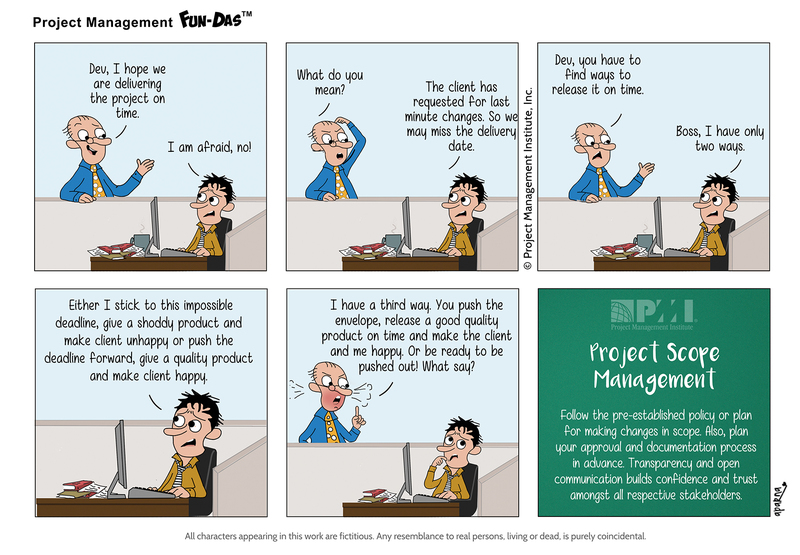 Scope Management 'Gold plating' means the addition of feature not considered in the original scope plan & is considered a bad project management practice.